Love, Mrs. Mommy: The Miracle Blanket Gift Set Giveaway! 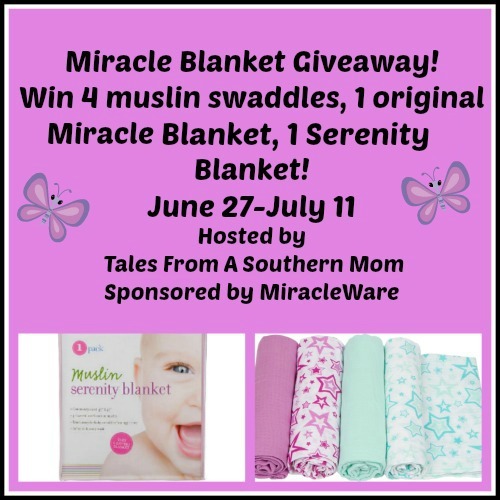 The Miracle Blanket Gift Set Giveaway! Open to US and Canada entries! :) Good luck! Tales From A Southern Mom is Hosting A Giveaway In Which One Lucky Winner Will Receive a Miracle Blanket Gift Set including a Miracle Blanket, A Serenity Blanket and 4 Miracle Muslin Swaddle Blankets $90 RV! Enter Today & Good Luck! PLUS a big shout out to all of the amazing bloggers helping to promote! 1 Lucky Winner Will Win a Miracle Blanket Gift Set of their own! Entrants must be 18 years old to enter and giveaway is open to US and Canada residents only. This giveaway will end at 11:59PM (EST) on 07/11/2016. Tales From A Southern Mom did not receive any form of compensation for this giveaway other than receiving this item in order to facilitate my review. Once winner is selected via the Rafflecopter process, the product will be shipped. Winner has 48 hours to respond or another winner will be chosen. No other blog associated with this giveaway is responsible for the product shipment. Miracle Blanket will be providing the prize above to the winner. Thank You for stopping by! Any Questions or Concerns email me at julie.talesfromasouthernmom (at) gmail (dot) com.